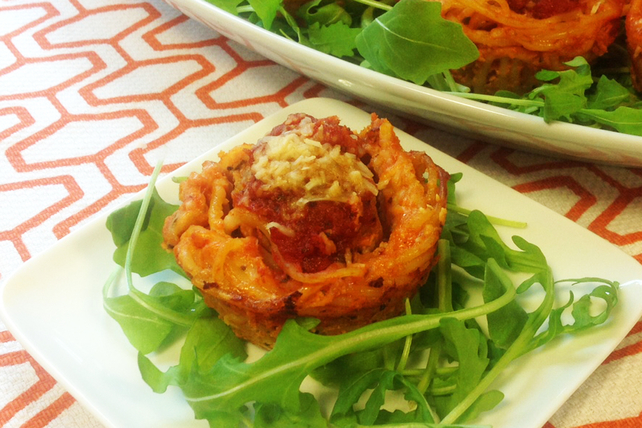 Everything you love about spaghetti and meatballs is neatly baked into individual nests. Try this fun twist on the traditional spaghetti and meatball recipe. Cook spaghetti as directed on package, omitting salt. Drain; place in large bowl. Add 1 cup sauce, eggs and mozzarella; toss until spaghetti is evenly coated. Press spaghetti mixture into 12 muffin pan cups sprayed with cooking spray; top each with 1 Basic Meatball. Cover with remaining sauce. Bake 17 to 20 min. or until heated through. Carefully run knife around each "nest" to loosen from cup. Serve topped with Parmesan. Cool remaining 3 doz. meatballs from Basic Meatballs recipe. Place in freezer-weight resealable plastic bags; seal bags. Freeze up 2 months until ready to use in another recipe. Serve nests over arugula salads tossed with your favourite Kraft Dressing.